The mid-century modern shape of the Abner Swivel Arm Chair is enhanced by the rivets on the chair back and bottom, conveying an industrial modern style. 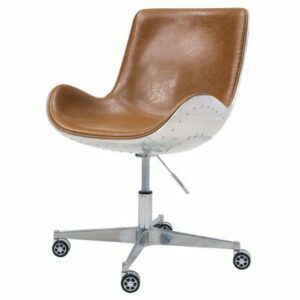 The supple polyurethane leather upholstery molds the shape of the chair, giving you long-lasting comfort. Assembly required, available in Distressed Caramel and Distressed Java.